Apple Cider Vinegar For Acne: Does It Work & Should You Use It? The Truth About Apple Cider Vinegar For Acne: Does It Work & Should You Use It? Is apple cider vinegar good for acne? Yes. Should you use it? No. Newsflash: just because something works, it doesn’t mean you should use it. Baking soda can exfoliate skin… and leave it a red, flaky, irritated mess that takes ages to recover. Apple cider vinegar (ACV) is the same. For one person who swears ACV cured her acne, there’s another who’s got burnt (literally!) by it. WTH?! What’s Apple Cider Vinegar And What Does It Do For Skin? Vinegar is made when alcohol meets bacteria. These little buggers eat the alcohol and poop out the waste product, acetic acid. It’s this acid that gives vinegar its low pH. Exfoliation: acetic acid speeds up the skin’s natural exfoliating process so that dead cells don’t end up in your pores and clog them up. Low skin’s pH: when your skin’s pH is too high (cleansing is a big culprit here! ), your skin’s protective barrier breaks down, putting you at risk of dryness and inflammation. ACV lowers the pH, fixing the issue (… or not?). When your skin’s not exfoliating properly on its own, dead cells fall into your pores. There, they mix with excess oil, forming a mixture that clogs your pores. This mixture just happens to be P. Acnes’ fave food. The little buggers munch on it, giving you pimple after pimple. If dead cells didn’t get stuck in the pores, P. Acnes wouldn’t have much to feast on. That’s where apple cider vinegar comes in. ACV is keratolytic, a fancy way of saying it helps dead skin cells shed faster. If they’re off your face, they can’t get stuck in the pores, right? P. Acnes doesn’t just need food to grow. It needs a 6/7 pH, too. Apple cider vinegar has a 2/3 pH. That’s much, much lower than P. Acnes likes. By lowering the pH of your skin that much, ACV makes it almost impossible for acne bacteria to grow. Is It Safe To Use Apple Cider Vinegar For Acne? If you’re thinking, “Awesome! I’m gonna get myself some ACV now,” wait. It’s NOT all good news. The low pH of apple cider vinegar isn’t bad news just for acne. It’s bad news for your skin, too. A ph of 2/3 is too harsh for your skin. It can cause inflammation, irritations and breakouts (the very thing you’re trying to avoid). In the worst case scenario, ACV even causes burning. Yep, some people get BURNS when they put ACV on their skin. Yes, – you’re absolutely right – they do. But they’re usually formulated in the 3.4-3.8 pH range. They rarely go lower than that – for a good reason. When you use 100%, pure, undiluted ACV, you’re risking a serious case of irritation… or worse. If you must use this stuff (and I DON’T recommend it), at least dilute it to raise the pH to a skin-friendly level. P.S. Aim for a pH of 4. It’s high enough for ACV to work and low enough to scare off P. Acnes. 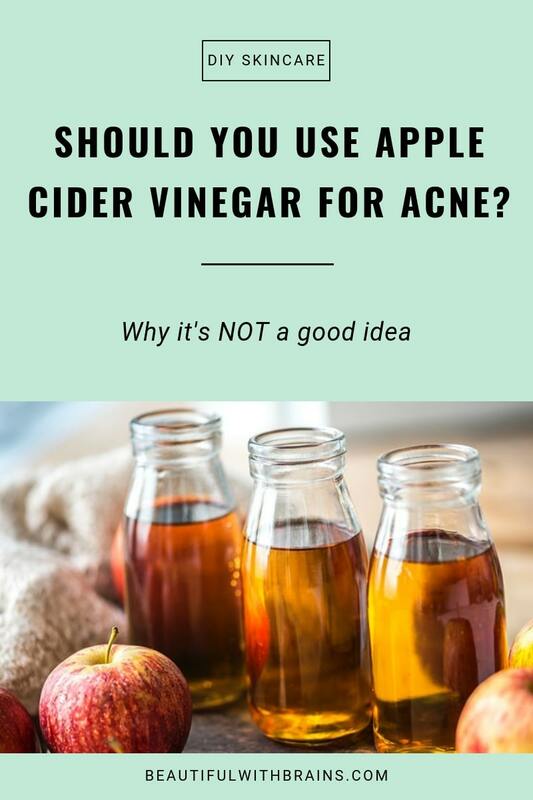 Let’s say you’re willing to dilute ACV so you can get rid of acne without burning your skin. I still don’t recommend it. There’s a reason why you won’t find acetic acid (the acid in ACV that give its skin-beneficial properties) in skincare products. It just doesn’t work that well. Glycolic acid: it fades away the dark spots pimples leave behind faster than all other acids (you can find my fave picks here). Salicylic acid: it gets inside the pores, removing all the dead cells and excess oil that’s clogging them up and giving you pimples. If you have acne, this is a MUST for you (check out my fave salicylic acid exfoliants here). Related: Salicylic Acid Vs Glycolic Acid: Which One Should You Choose? There’s some anecdotal evidence that apple cider vinegar helps treat acne by exfoliating skin and making it an inhospitable environment for acne bacteria. But it’s very harsh for the skin and can cause irritations, breakouts and even burning. Why use it when there are safer alternatives? Have you tried apple cider vinegar for acne? Share your experience in the comments below. Can This Works Sleep Plus+ Pillow Spray Help You Get Your Beauty Sleep? Is Alpha-H Essential Skin Perfecting Moisturiser SPF 15 The Only Skincare Product You Need In The Morning? Can Vaseline Really Make Eyelashes Grow Longer?